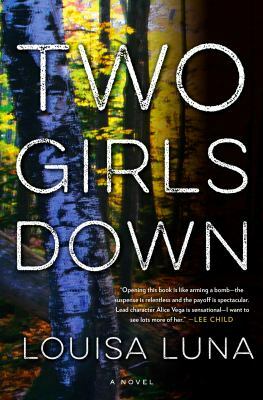 Posted on October 13, 2018 by Katharine L.
In my opinion, Two Girls Down by Louisa Luna was one of my favorite reads this summer. I’ve been pretty content to say that my summer reading list has been comprised of some pretty awesome (for a lack of a better word) books, but this combination of a mystery and thriller book blew me away. When you first realize the plot, it’s not the most exciting one in the world (not that it stays that way). Not one like Harry Potter, where you find out about Hogwarts, and the next second, everyone’s flying on broomsticks, and you really envied all those magical children out there that were casting spells and you were sitting at home reading about them. No, Two Girls Down is a whole other story. The story is centered around two sisters, Kylie and Bailey Brandt, and their mother, Jamie Brandt. The story started off at an intriguing pace, leaving me turning the pages hastily to keep up. I was hooked from the very beginning. I loved how the author developed her characters right off the bat, letting everyone know the sister’s similarities and yet quite noticeable differences, too. This would become essential later in the story. Things are pretty average at the beginning of the story. The two girls’ mother, Jamie, is leading a not-so-perfect-with-a-cherry-on-top life, but she manages. Their father left them a long time ago, claiming not to have the time or energy to raise two young girls. But one day, Jamie’s world shatters and tumbles into a whirlwind of chaos as her beloved daughters, Kylie and Bailey, vanish underneath her very eyes. The girls are last seen in the parking lot of a mall, where Jamie left them to go shopping for a gift for Kylie’s friend’s birthday. When she gets back, no traces of them remain, and she begins to become frantic. But here, in shining armor, rise the heroines of the thriller. A very, very unlikely pair. A retired officer named Max Caplan, and a former bounty hunter, Alice Vega, brought together by strange events that could only be the doing of fate, put aside their differences and share their knowledge with each other on a wild chase from town to town, desperate to find the missing girls. Alice Vega proved to be someone who worked in a solitary way, not needing accomplices or friends, but a tough, hardened woman who could fight life’s problems on her own. But she realizes that she could have never fight alone again after meeting Max Caplan, who proves to be a kind, more logical figure in the mystery. It was one of the weirdest crime fighting pairs I’d ever read about, but once I started, they quickly rose to one of my favorites. They balanced each other out so well, and I really enjoyed the way the author chose to incorporate that. To read the novel was like being a detective on your own part. I felt fully immersed while reading, feeling the pair’s frustration, their anger and pain, their sorrow throughout the journey (all while I sat motionless on my couch and my eyes burned holes into the pages). My heart pounded when fight scenes emerged, and later, sighing in disappointment as different leads fell away. I’d highly recommend this book to anyone who’s wanted to read a mystery thriller, because I think it’s truly exceptional. I would have never guessed the ending, since the author gave nothing away. The leads and evidence tied together so perfectly in such an intricate fashion that I was never tempted to put the book down, even after I read it twice. I promise, you won’t be disappointed by this read! Two Girls Down by Louisa Luna is available for checkout from the Mission Viejo Library. Posted on June 13, 2018 by Katharine L.
Okay, confession time: I’m not really into Japanese anime and manga, or things like that. That is, until I read SAO, or Sword Art Online by Reki Kawahara. To be clear, there are basically three adaptations of this book. 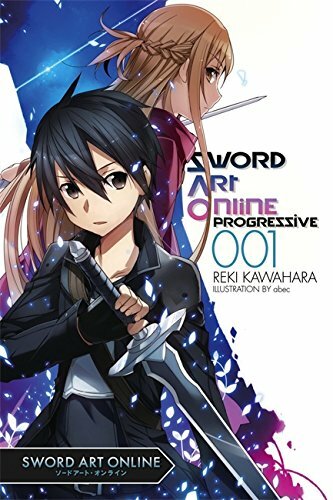 One of them is a graphic novel, but this book, SAO Progressive 001, is a fictional chapter book that’s about 300 or so pages long. To be honest, I probably wouldn’t have picked up this book if it hadn’t been for my friends, who are obsessed with Japanese manga and stories. The cover art is really cool, but personally, I just wasn’t that interested. One of my friends, who had read the book cover to cover about thousands of times, allowed me to borrow it. At first I was doubting it, but since the cover looked awesome (I know, don’t judge by a book by its cover! Sorry! ), I decided to open it. And then I pretty much didn’t put it down. The story is centered around the main character, a dark-haired swordsman named Kirito, shown on the cover. Next to him is a fencer, named Asuna. Sword Art Online is a a “virtual-reality” world game, where the player is transported into the gaming world, filled with monsters on each level of the hundred floors of a floating, chambered castle: Aincrad. However, there is no escape. Once you enter the game, there’s no way you can leave it. And the death toll begins to rise. 2,000 players are dead, killed by the monsters in the game. Kirito meets Asuna in the beginning of the story, and over the events happening throughout the book, they form a sort of friendship. They’re not exactly a team, for they are both solo players, only working to strengthen themselves. But when fighting alone means certain death, will Kirito and Asuna overcome their differences and fight together to survive? I highly recommend this book to anyone looking for high-action, intense combat scenes against bosses, and a story that keeps you hooked in every page. Would you wish SAO was a real-life game that we could play? Anyways, I can’t wait to read Sword Art Online Progressive 002! I’m sure Reki Kawahara won’t let me down! Posted on March 25, 2018 by Katharine L.
Mountaineer Jon Krakauer had a long-lasting dream, ever since he was a little boy: to climb the world-famous Mount Everest. Into Thin Air is, as Krakauer puts it, not exactly an autobiography but merely his own account of what really happened on the peak of Everest in the terrible tragedy in 1996. Many people died on the expedition to Everest, like renowned guides such as Rob Hall and Scott Fischer. It appalled me to see the harsh conditions in which the climbers labored through, the various health conditions they had to endure, and just how difficult the fact of breathing was at such a high altitude. I really enjoyed reading this book; usually autobiographies are not my favorite genre, but this one blew me away. Krakauer is very meticulous in detail, and he describes everything that happened on that mountain very specifically. I really appreciated that; I felt like I was there on the mountain with him and the other climbers, and knew exactly what he was experiencing. The way he also described the feeling of being stranded and blinded in the middle of the snow storm on top of the world was superb. I mean, I was grabbing the book and frantically flipping through the pages, wanting to see if everyone made it out okay. They didn’t, to my horror. In fact, in this book, I learned quite a lot of things that I had never known about mountaineering before, like these spikes on a climber’s boots known as crampons to help grip the ice, or how the climbers had to do acclimatization exercises before actually attempting to ascend the mountain. Throughout the book, many brave climbers prevailed, and the cost of sacrifice and loss was sorrowful. Even though I had not known these people previously, I felt bad for their untimely fate. But many were brave and loyal enough to go back and and try to save their fellow climbers, and many that are alive today from the incident of 1996 thank those courageous climbers. I’d highly recommend this book to everyone; this is one of my favorite reads! From action-packed to intense scenes, horrifying terrors to unthinkable grief, and courage and loyalty of many climbers on Everest in 1996, this book is truly excellent. 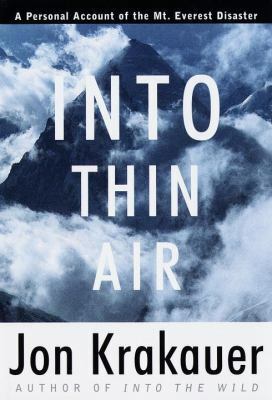 Into Thin Air by Jon Krakauer is available for checkout from the Mission Viejo Library. Posted on March 1, 2018 by Katharine L.
Recently, one of my friends, Zac, turned 13 and explained to me that he was holding something called a Bar Mitzvah. I wondered what that was, because I’d never attended one; I was expecting just a normal birthday party. After doing some research, I realized that traditionally a Jewish child would participate in a coming-of-age ceremony at 13, called a Bar Mitzvah. I finally understood what the event was now. My friends and I attended the Bar Mitzvah to celebrate with Zac, and it was such a great experience. There were two parts: The Torah, and then the reception later in the evening. The way the Bar Mitzvah is held is actually really similar to that of a wedding, with the long tables, DJ, dance floor, flower assortments, lights, etc. I was very impressed in the dedication that Zac put forth in the ceremony. He memorized long Hebrew passages and sang songs to praise Jesus. The ceremony lasted about an hour, where he underwent many different spiritual rituals, like one particular flag-bearing. He did really well, especially while playing his guitar and reading his well-prepared speech. It was also very touching when his parents gave a speech and recognized him as a truly worthy son. Zac told us that he’d spent almost two years, and all that hard work and dedication really paid off! Finally, the reception was very well put together. There was a lot of dancing (Zac got lifted and twirled up in the air on a chair), and it was all fun. There was ice cream, and three courses that were extremely tasty. The family put a lot of effort in the arrangements and the whole event turned out really well. I really enjoyed this event, and had the time of my life! Posted on February 3, 2018 by Katharine L.
But what if that imaginary sibling became real? Answer: Some really, really bad stuff would happen. In C.J. Omololu’s thriller and mystery combined in one, The Third Twin is sure to leave you flipping the pages like there’s no tomorrow. If you’ve ever read Pretty Little Liars, or maybe you’re a fan of the TV series, this book is pretty similar, but with more of a haunting twist. Even the cover looks cool! But anyways, everything started out as a joke. The main characters, identical twins named Lexi (Alexa) and Ava (they’re seriously identical, because you really can’t tell the difference between them at all), make up a third twin, Alicia, just for fun. Who forgot to take out the trash? Who totally smashed that new iPhone? Alicia! Duh. Lexi and Ava decided that that was a total no-brainer. As they grew up, they used Alicia as a cover-up for doing things that they wouldn’t normally do in real life. Nobody needed to know about this secret Alicia. She only existed when they wanted her too. Until Alicia becomes real. Now Ava and Lexi are up to their necks in hot water, and it may not seem like they can get away without some pretty hard consequences. Because a boy is found murdered, and all traces point directly at Alicia. The girl who never existed. Or perhaps Alicia is real. 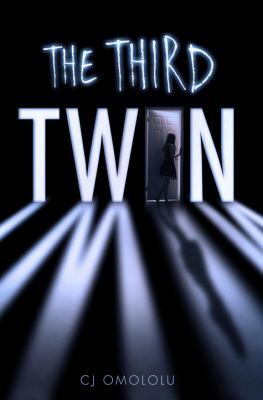 The Third Twin by C. J. Omololu is available for checkout from the Mission Viejo Library. Posted on January 10, 2018 by Katharine L.
What better way to spend the holiday season than to sit down next to the fire with a cup of hot chocolate in hand, reading a holiday-spirited book? If that is the case, bear Charles Dickens’s classic A Christmas Carol in mind. If you’re more on the relaxing side, curl up on the couch and watch the movie. Both are great choices, but here’s some key differences between book vs movie. Many Americans are familiar with the story of miserly old Ebenezer Scrooge, whose heart is cold and inhospitable. 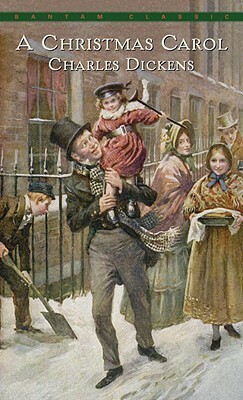 But after encountering three spirits of Christmas, Past, Present, and Future, Scrooge becomes a changed man, brimming with joy for Christmas season. The movie, which was released in 2009, is more lighthearted than the actual book, as often happens. When Charles Dickens wrote the book there weren’t many jobs, and lots of people were homeless and dying of hunger. However, when the movie was made, the economy was much better and people were more joyous. Scrooge’s father is also considerably more generous in the movie, leaving Scrooge meager amounts of money, while in the book, the poor lad is sent straight to a new Master named Fezziwig. In the movie Scrooge seems much younger than he actually is; in the book, he is around 70, weaker and frail. Each in turn, the three Spirits show Scrooge a memory or a future, and these images haunt Scrooge, who begins to feel guilty. He sees his nephew Fred making fun of him; he sees his clerk, Bob Cratchit’s son, Tiny Tim, die, the family mourning; and in the end, he sees himself on a deathbed, while others cherish the fact that he is gone…. Of course, movies tend to dramatize these events, making them more exciting. The scene where Scrooge is going to fall into his grave is very intense, and so is the music. But when Scrooge wakes up, his reaction in the book and the movie are very similar; he is giddy to be alive, and honors Christmas with a joyful heart. Either way, both are full of action, love, and are sure to warm you up for this holiday season! A Christmas Carol by Charles Dickens and its film adaptations are available for checkout from the Mission Viejo Library.